Here is a photo with the tower where is errected the antennas of SV5 beacons. 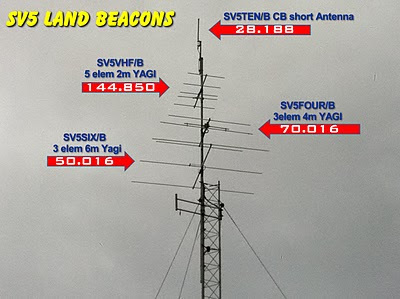 All antennas except CB short Antenna are homemade according DL6WU antenna design software. The "ROHN" tower is 9m tall and the antenna sight is about 800m ASL. All antennas are pointing to 330 deg.